17.06.2018: ... at Jukasa Motor Speedway Racecar driver Alex Tagliani finished third in Saturday night's round 2 of the NASCAR Pinty's Series race held at the one kilometre Jukasa Motor Speedway oval track, located in Hagersville, Ontario. 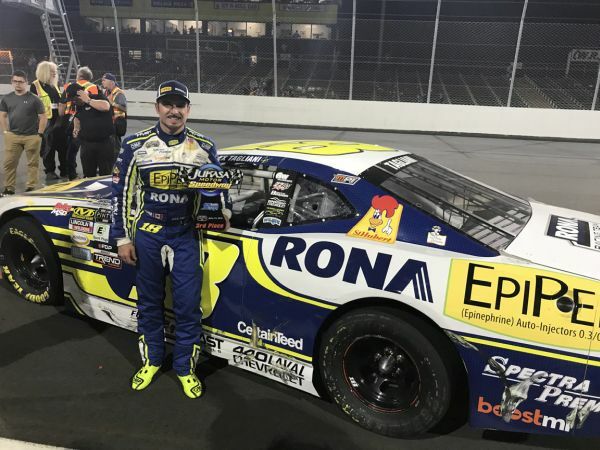 Racecar driver Alex Tagliani finished third in Saturday night's round 2 of the NASCAR Pinty's Series race held at the one kilometre Jukasa Motor Speedway oval track, located in Hagersville, Ontario. Starting sixth on the grid, Tagliani was fourth by lap 50 of the scheduled Rankin 200-lap affair. The Tagliani Autosport/22 Racing Team driver stayed in the top three throughout the race, challenging for the lead several times. This was the Canadian driver's best finish on this track. 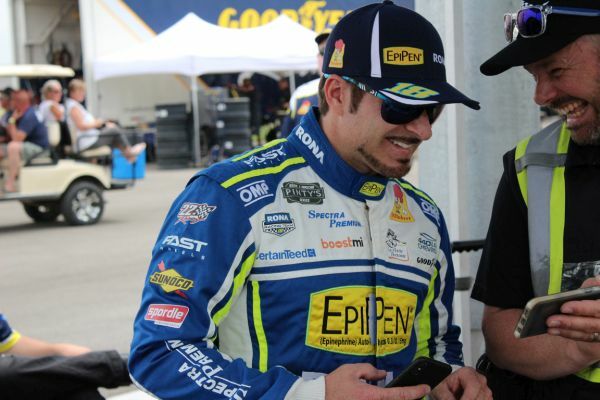 "A fine race result," said Alex Tagliani, quite pleased with the overall on-track performance of his EpiPen-RONA-St Hubert Chevrolet Camaro ZL1 at Jukasa Motor Speedway. "To finish third in a brand new, untested car that had never even ran a mile before tonight is quite an achievement. Team 22 Racing was apprehensive as to the reliability of the new Camaro. But, we can say that we accomplished quite a feat when we crossed the finish line in the top 3. It bodes well for the rest of the season. With three laps to go in the opening race of the season at Canadian Tire Motorsport Park, we were leading prior to our problem and here, we closed the deal by finishing third. The team will work hard in the upcoming weeks to improve the car. "Aside from the fact that the engine started to sporadically misfire during race restarts around lap 80, we brought the car home. This mechanical problem exposed us to the competition and denied us when needed the maximum horsepower to keep up with race winner Kevin Lacroix. We are coming to Quebec in 15 days to run at Autodrome Chaudière, and until then, we are going to fix the engine situation." The Rankin Construction 200 - a 206-lap race with a NASCAR overtime finish - was won by Kevin Lacroix who scored his first-ever NASCAR Pinty's Series oval victory. He crossed the finish line only 0.365-second ahead of Cole Powell. Tagliani was third, followed by Marc-Antoine Camirand and Andrew Ranger.
. In the point's chase, Tagliani is back in the hunt in seventh place with 72 points, only 17 back from front-runner Lacroix. In 60 NASCAR Pinty's Series starts, Tagliani has six wins, eight poles, 23 top-fives and 39 top-ten finishes. The Jukasa Motor Speedway race will air on TSN2 on Saturday, June 23 at 2:00 p.m. ET. Fans can visit Alex's Facebook page https://facebook.com/Tagliani to find out more on the Canadian racecar driver. 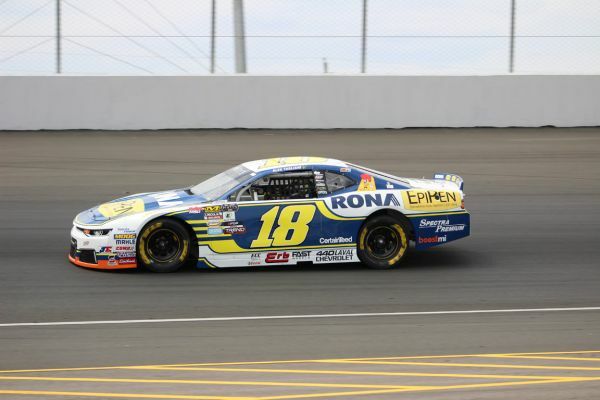 They can also follow Tag on Instagram @Tagliani18 as well as on Twitter @Tagliani at https://twitter.com/tagliani during his season-long quest for top honours in the NASCAR Pinty's Series. The Pinty's Series will travel to Vallée Jonction, Quebec for its first of two races in the province this season. The fast quarter-mile Autodrome Chaudière track will host the Pinty's Series for the fifth consecutive season on Saturday, June 30 at 8 p.m.